Waiting On Wednesday is a weekly event, hosted by Jill @ Breaking the Spine, that spotlights upcoming releases that we’re eagerly anticipating. I absolutely LOVED the Mara Dyer series! LOVED IT, loved it! It was the perfect blend of creepy and mystery, haunting and dreamy! Noah is one of the main characters and one of my top book boyfriends so I am sooo excited that not only is he getting his own SERIES (I assume from his POV!?!?!) but it will still feature him and Mara! Eeeek! The Fangirl is starting to come out (can’t you tell with ALL THE CAPS)! The blurb is super vague, I’m assuming it takes place after the Retribution of Mara Dyer but I could be totally wrong! You never know with Michelle Hodkin but I don’t care I will take any scraps I can get! I was planning a reread of the Mara Dyer books before this comes out but with all the amazing October new releases it may not happen unless I can get ahold of the audio books that Audible keeps so heavily guarded. Christy Carlson Romano read the audio books and is the perfect voice for Mara! I wonder who they will have read Noah’s series? Oh gosh I’m so excited! Hurry November HURRY HURRY! 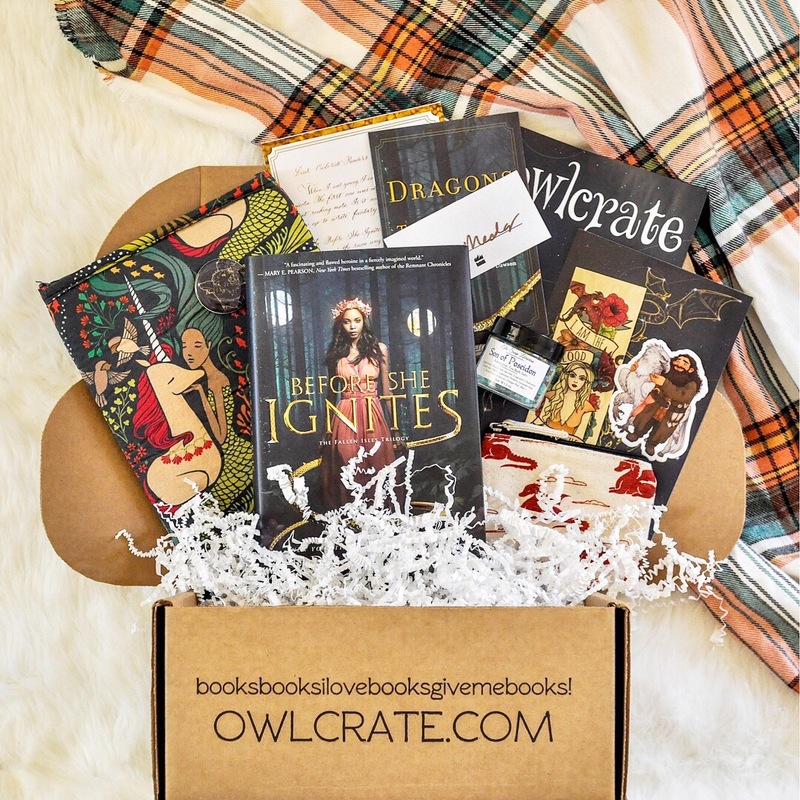 September’s Owlcrate may have been the best one yet, I mean it came with a BOOK SLEEVE from the infamous BOOKBEAU! 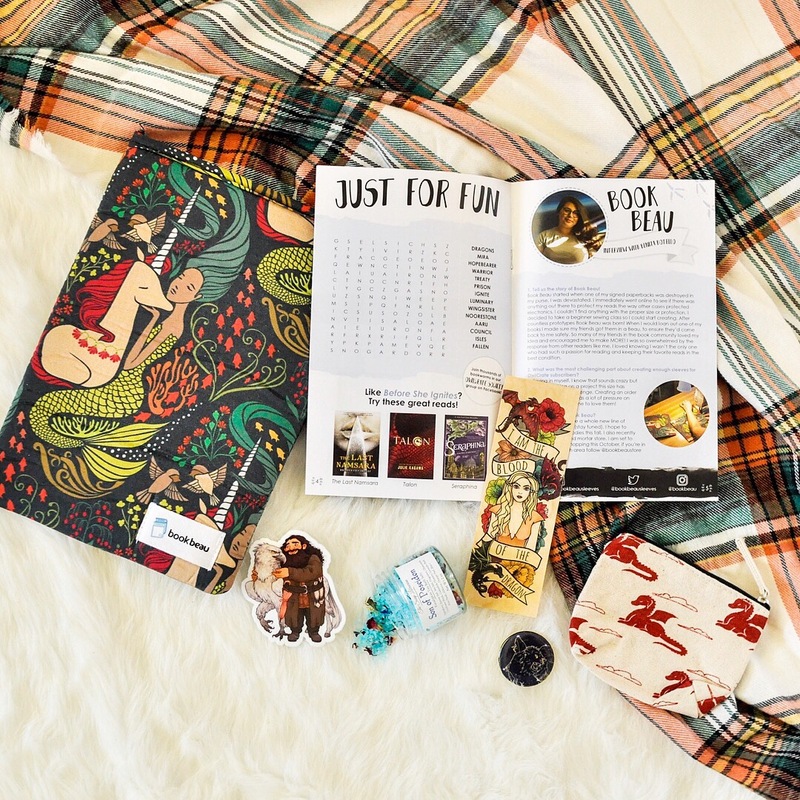 This favoritism has nothing to do with my new addiction to book sleeves BTW. . Anyways, the theme was Mythical Creatures and actually contained a Percy Jackson item in it which is a first! 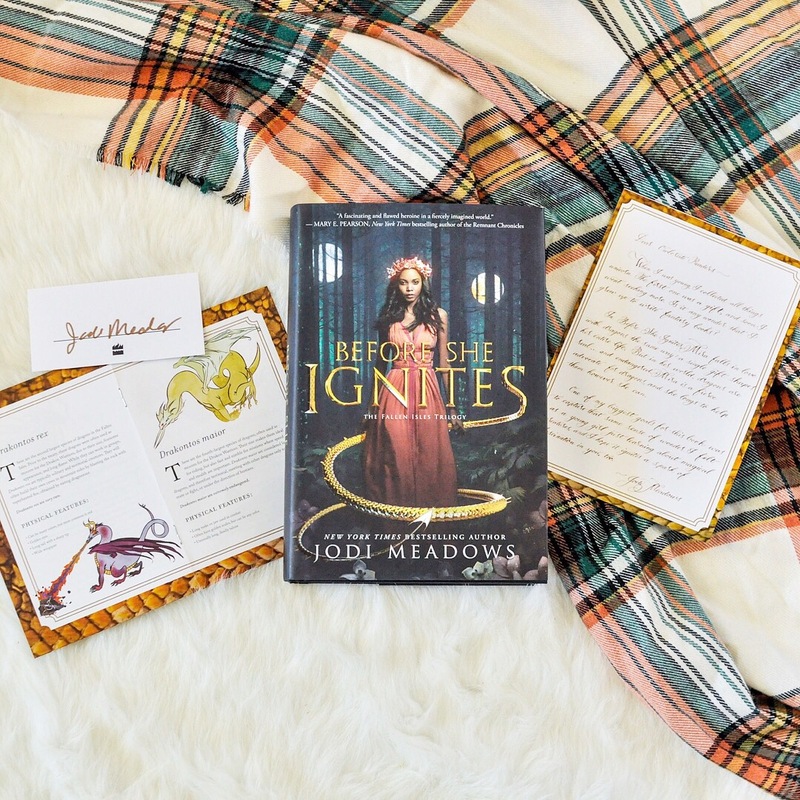 Before SheIgnites by @unicornwarlord (which had an exclusive cover, signed bookplate, letter from the author, and guide to the dragons in the book)! I’ve heard great things about Before She Ignites. I may have to move it up on my list to behind Turtles All the Way Down and just before The Becoming of Noah Shaw. Ah so many great books coming out I love it!! Here’s my full unboxing with a little help from Chairman cat. 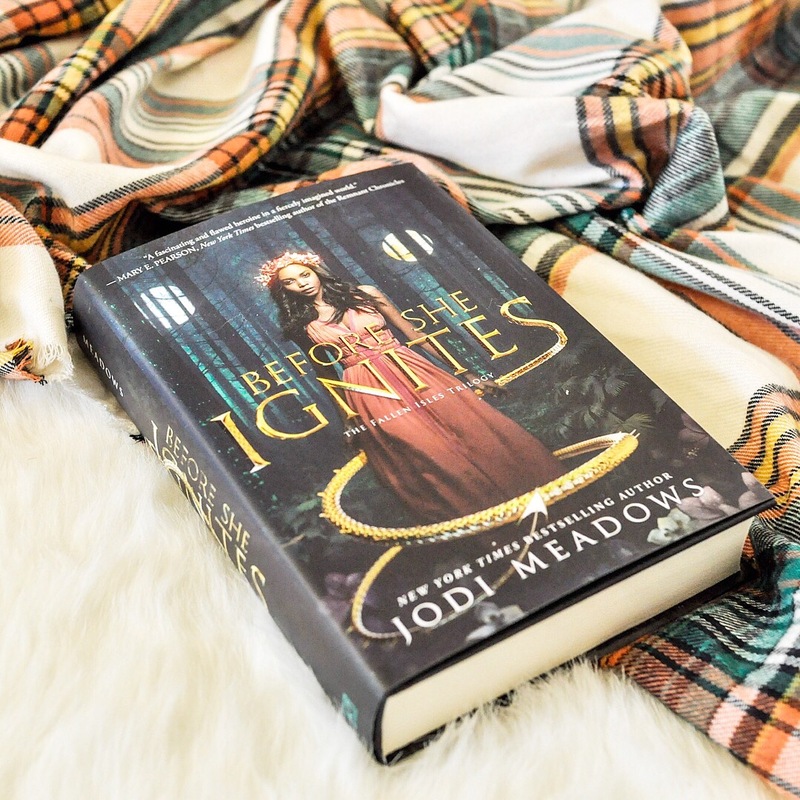 OH MY GOSH I LOVED THIS BOOK AND I NEED THE SECOND ONE RIGHT NOW! I am not even kidding. After the disappointment that was the Young Elite series I was both nervous but so excited for this book and IT DID NOT DISAPPOINT! This book reminded me a lot of Ready Player One in many ways. Also set in a (not so?) futuristic world where a virtual reality game called Warcross has become the obsession of the time. So as stated in the blurb Emika hacks into the opening of the Warcross World Championships and, instead of getting in trouble for it, she is offered a job by the creator of Warcross. He needs a spy to insure the safety of this years tournament and to uncover a security issue. Emika is then drafted onto a team and is thrust into the World Championships of Warcross. Everything about the games from the wild card drafting to competing in the the different areans just blew me away! I mean, can we talk about the world building please. OH.MY.GOSH. So I absolutely LOVED Marie Lu’s Legend series and the world building she did there. This was 5 steps beyond that. (Also Marie Lu did state that Warcross and Legend DO take place in the same universe and one is the future of the other! This could be the past of the Legend world!!) It was not hard at all to imagine this world as I was reading it. I was constantly seeing it in vivid colors, both in the games and in the Tokyo setting. Sometimes I am just amazed at how one person can create such a crazy vivid realistic but totally fantasized place with just 26 letters rearranged over and over again. And that my brain can take those letters and project this vivid colorful world into my mind perfectly.. I really liked Emika’s character. I love the fact that she has rainbow hair, I love WHY she has rainbow hair. I can sympathize with her past. She’s very likable right off the bat! She is cleaver and sneaky and just all around awesome! I’m sorry, my fangirling is starting to take over again. -deep breaths- There was a lot of diversity in this book as well. Emika is Chinese-American, the Captain of her Warcross team Asher Wing (Day’s possible ancestor???) is in a wheelchair, Hideo Tanaka is Japanese with a British accent and of course since this is a World Championship there are many other nationalities involved. Annnnd the cliffhanger was brutal! But I really didn’t expect anything less from Marie Lu. . I am in desperate need of the sequel! I also just finished Ryan Graudin’s Invictus and now all I can think of is getting ahold of a Recorder’s Time Machine and time traveling to 2018 to get my hands on Warcross #2 (rumors are it might be called Darkcross??) and more information as to how this coincides with Legend!! This book was INSANELY good! I received it in my August Once Upon A Book Club box and the gifts that came with it just made reading it sooo much better! Sorina and her “family” are so interesting. Sorina doesn’t have eyes but she can see and create illusions for others to see. She creates her own family, a grandfather figure, a sister thats also a best friend, funny bickering little brothers. These illusions perform in a Freak Show in the Gomorrah Festival, all having their own odd talent to add to the show. Our story starts out with one of her family members being murdered. This is obviously a problem for more then one reason. 1. Murder 2. Illusions can’t be murdered. Or can they? Lets talk about the Gomorrah Festival itself. While it is indeed a traveling festival it is also a traveling city with a rich dark history. I loved the vivid descriptions of the festival and the different shows and booths. Gomorrah is split into two sections, there is Uphill where Sorina’s freak show performs and then there is Downhill where the darker more depraved shows and booths reside. There is a sharp contrast between the two and it was interesting to see it through Sorina’s eyes, someone who has lived with the festival almost all her life and yet she rarely ventured into the Downhill. Sorina herself was a very strong character. She loves her family dearly, even though they aren’t truly real and she will stop at nothing to keep them safe. The craziest thing about her wasn’t her illusions, SHE HAS NO EYES! Yet she can see! The sight of an eyeless face unnerves most people so she wears masks almost all the time. It was so interesting to learn about her abilities as an Illusion Worker through her thoughts, her description of their strings pooling around her feet as she manipulates them. Crazy descriptive writing on Foody’s part! I loved the mystery of this book. It was the perfect blend of mystery and magic! It kept me guessing right up until the end. The twist really got me! It was so hard to put it down at times! I am now eagerly awaiting Amanda Foody’s next novel Ace of Shades she did so well with this debut novel I can’t help but have high hopes for the next one! 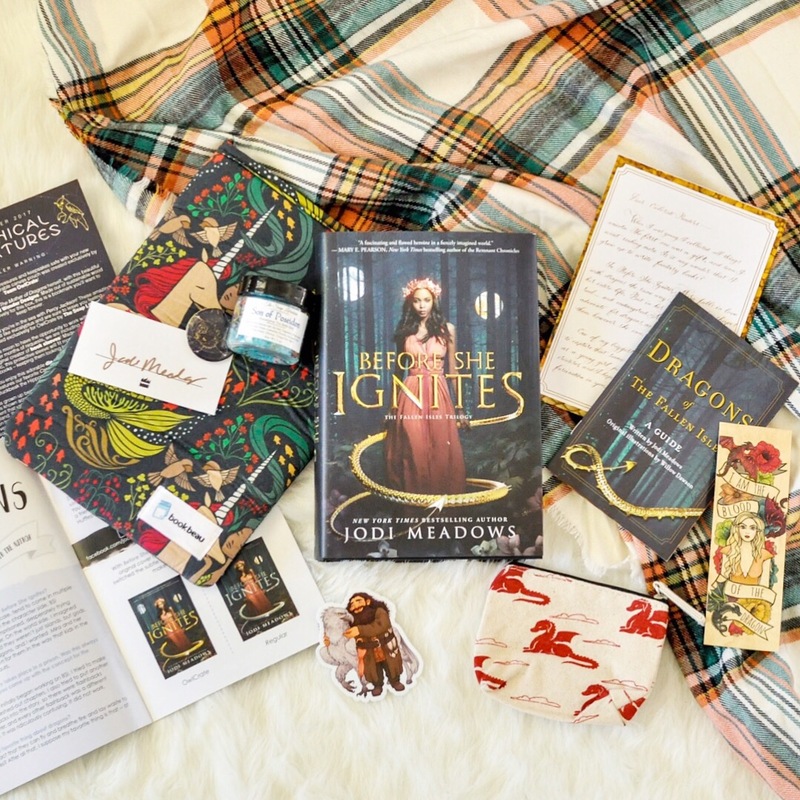 My Once Upon a Book Club box with Daughter of the Burning City and all the correlating gifts! I really enjoyed McGinnis’s Female of the Species. It was dark and emotional and powerful and really made you think. Reading this summary makes me think of Female of the Species. While McGinnis’s books have been hit or miss for me, this one really intrigues me and I’m looking forward to it, hoping it will be as good as FOTS. It releases the same day as John Green’s Turtles All the Way Down and Maggie Steifvater’s All the Crooked Saints. Talk about competition. I still haven’t decided which one I’ll be reading first! This month I only read 6 new books and reread four old favorites. It really felt like I read more then this. huh. Well 4 of the 6 were new releases that I flew through and will hopefully actually review them. I’ve gotten so lazy about reviews. Maybe my life will calm down enough to actually sit down and think and write a review. and maybe llamas will start talking. Anything can happen! My favorite was probably Warcross. I don’t know. WW, Hunting Prince Dracula and Daughter of the Burning City were very close contenders. Heck I loved them all equally! For September I was also a rep for 3 very awesome companies! I have loved every minute of it! All three of these companies are fantastic and produce good quality merch. Angela’s designs are gorgeous and continue to amaze me every time she releases a new one! Sam and Michelle and Logan create amazing boxes with gifts that seem like they have been pluck right out of the included book!